Last weekend while making some treats to take to a friend’s daughter’s graduation party, I searched Hoosier Homemade for the Mini Cheesecake recipe that I’ve made over the years, and quickly realized that I never shared it. 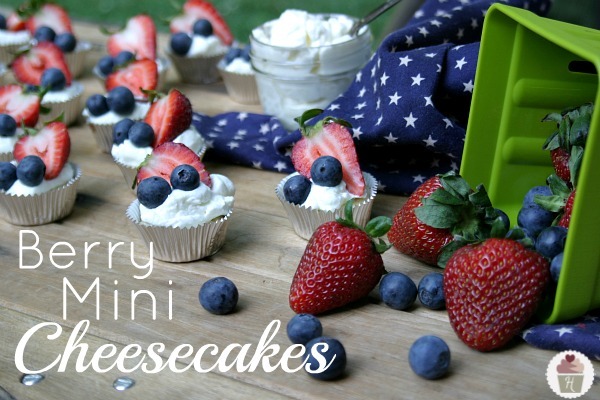 With Fourth of July right around the corner, I thought you might enjoy these Easy Berry Mini Cheesecakes to take to your Celebration! 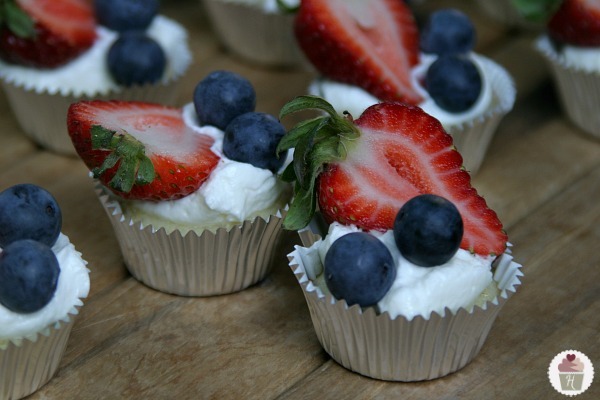 The Mini Cheesecakes are simple, easy and can be topped with any fresh fruit, canned pie filling, or even chocolate. 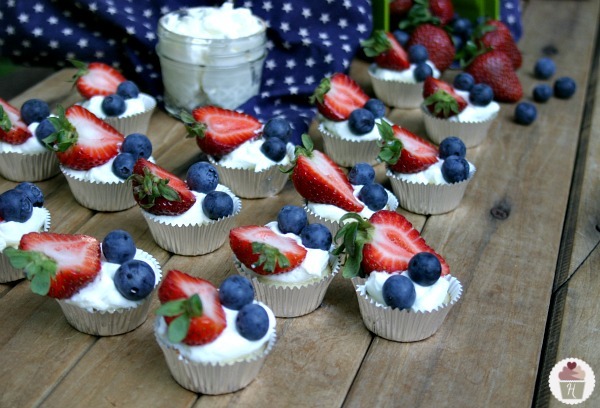 To make them festive, I added some whipping cream, a sliced strawberry and a couple blueberries. Love cheesecake? I bet you will LOVE these recipes! Toppings: fresh fruit, whipping cream, canned pie filling, etc. 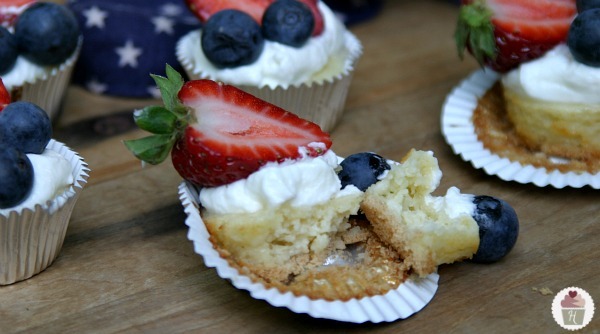 Stay tuned each day as I shared yummy desserts, crafts, decorations and party ideas for your Fourth of July Celebration! These are delicious and very popular! However, “about 1 tablespoon of cream cheese mixture” must mean a VERY light tablespoon. I just made a 1/2 recipe and measured out level tablespoons, and got 26 mini cheesecakes. But I made them before, so I knew it was going to be light. Is that Cool Whip or Reddi Whip…or homemade topping? Hi Courtney, I used homemade topping, but you can certainly use Cool Whip or Reddi Whip, whatever you like best. How would you change the recipe if just making with regular muffin tins (instead of mini)? Hi Christie, the only difference would be the amount you added. Instead of the bottom being a whole cookie, you can crush them and add about 1 tablespoon to the bottom. Then just add more cheesecake filling to the liner. Hi Sharon, I have never frozen them. I would think they can be, but I would wrap them really well and put them in an airtight container. What determines if one of your recipes are a 5 star or 4 star? The star rank is simply personal preference and how easy the recipe is to make. These look so yummy & beautiful as well! Out of , how do you rank your recipes? Hi Megan, do you mean how do I put the rating on the recipe? On the printable version? DELICIOUS!!!!. I would love if you linked them up to Show Off Monday @ Kampenlane.com on Monday.